On Wednesday, Dan Costello and Will Alexander, presenters with the Erin Simpson show, visited School for our Duffy Role Model Assembly. Dan and Will were welcomed by Te Tipuranga, and handed out Duffy books to selected children. They shared their favourite books with the children, the 'Complete Works of William Shakespeare', and Dr Seus 'Oh the Places You'll Go'. 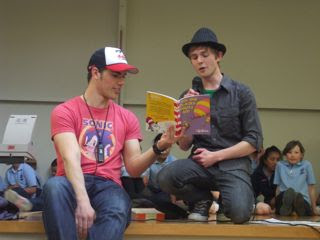 Dan read his Dr Seus book to the assembly and encouraged the children to keep following their dreams. After lots of questions about the Erin Simpson show, and a "few" autographs, Dan and Will were finally able to leave.